Personal Branding Workshop with AMW and Camelion Circus Show for a Cause! To see my name beside big speakers excites me! Seriously, I am thanking the Lord every second of the day for giving me such wonderful blessings! 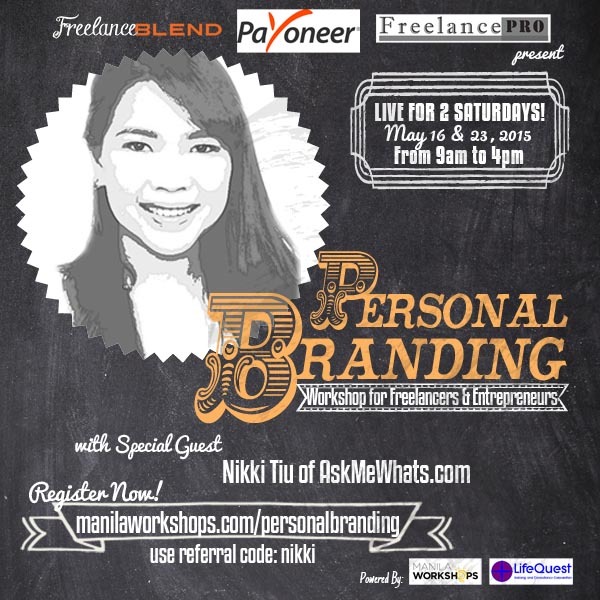 It is a Personal Branding Workshop for Freelancers and Enterpreneurs. To those who don't know, I am actually a full-time mom and a full-time Freelancer! I have a day job as an HR Consultant in an International Executive Search firm for 9 years, at the same time, I do make up on various clients and workshops for various big cosmetics brand. And of course, everyone knows I'm a Blogger of this website for more than 8 years! How do I deal with the deadline? Work related stress and still be there for my son? Well, I'm definitely sharing some of my tips and ideas on how I handle my small business and get my name OUT THERE. It takes a lot of effort and time and I'm definitely sharing what I've been through or what I have been doing to keep my name out there! P.S. I will be on the May 23rd 1:00pm onwards slot. 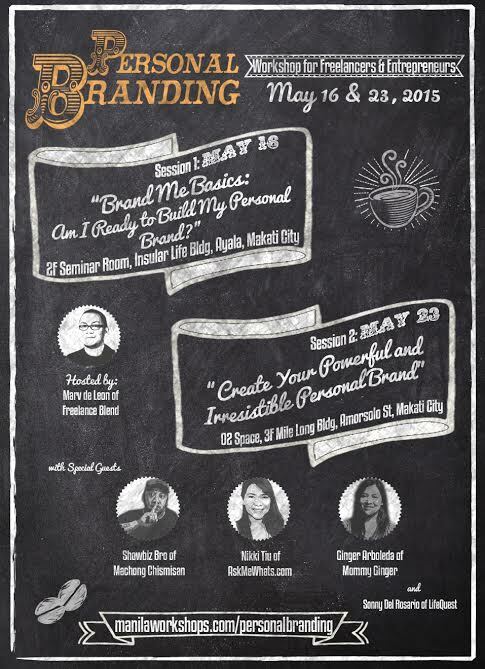 feel free to Register now at www.manilaworkshops.com/personalbranding and get 20% discount if you use the code "nikki". Promo ends May 10, 2015! And before I end this post, I want to share something! I was introduced to an upcoming event called Lukso! 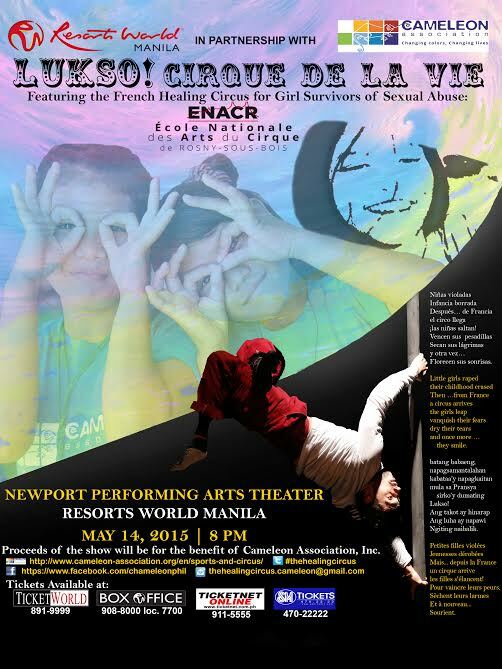 Cirque De La Vie: Healing Girl Survivors of Sexual Abuse which will happen at Resorts World Manila's Newport Performing Arts Theatre happening on May 14, 2015. Why I'm sharing this? well, as we all know, the topic of child sexual abuse is taboo in our country, sometimes, people try so hard not to talk about it "kasi Nakakahiya!". That's why I look up to Cameleon Association Inc. because this association is dedicated to helping young girls who have experienced sexual abuse regian possession of their bodies and soul. So what's the relation of Cameleon and the Circus? Well, Cameleon believe that the "Circus Therapy" can help the girls come out of their shell, feel well and have fun building a positive image of themselves. So for the first time, Cameleon and the French Circus Volunteers from the Ecole Nationale Des Arts Du Cirque will perform and the public will have the opportunity to see the pure French circus in its unadulterated form. Wow! You're a supermom! Congrats on that bigtime gig. I know it's not easy to juggle all your tasks and still be a doting mom to your sweet child so i also have to congratulate you on that! ms nikki congrats! i just wish i could be there! thanks dear, sana nga you can join!